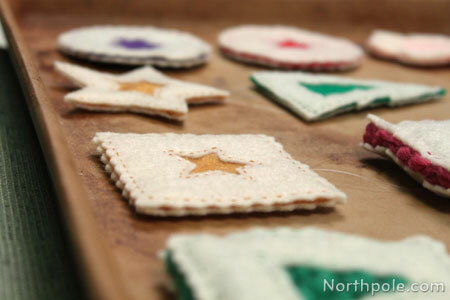 These adorable felt cookies are the delightful result of experimenting with the reverse appliqué technique. 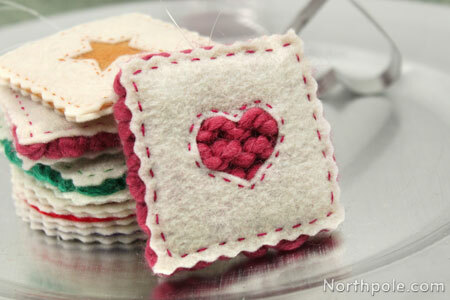 You can use felt for the cookie and the jam, or you can knit or crochet the jam to give your cookies a fun texture. Get creative with the shapes of the cookies and the inner cutouts to make these sweet cookie ornaments. 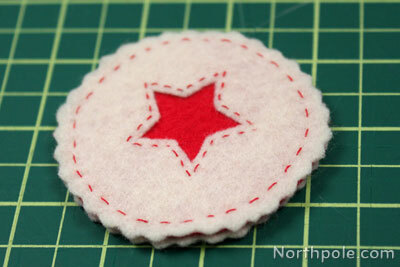 Pin or trace the template onto felt. 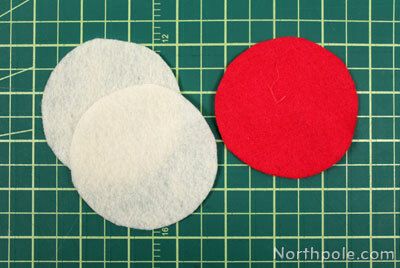 Cut 2 shapes from ivory felt and 1 shape from colored felt. We skipped using pins altogether since the shapes are pretty basic. We just placed the pattern on the felt and cut around it. 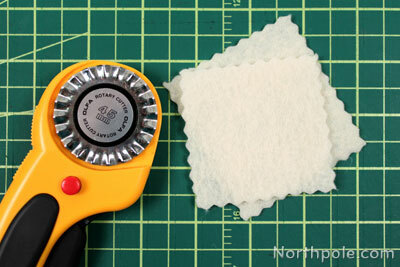 Stack the two ivory shapes together and cut along the edge with a pinking blade on a rotary cutter. 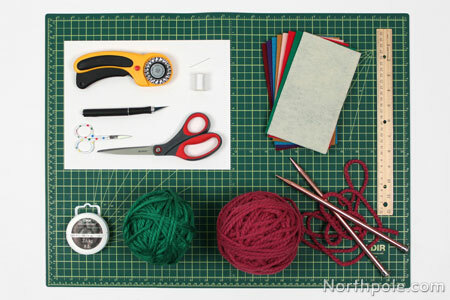 You don’t want to cut too much—just enough to shape the edges. Note: For the squares, use a straightedge. For the circles, cut it free-handed. Take one of the ivory shapes and cut out the center shape. 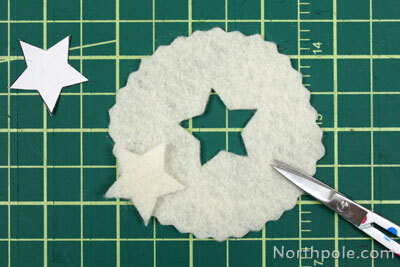 Cut the shape freehand or use the template as a guide. We used the star template here, as shown below. 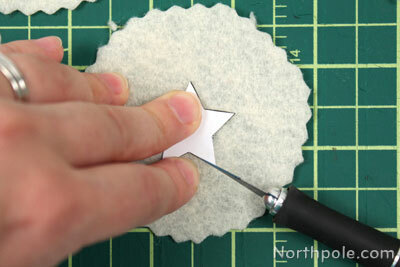 Note: When cutting the more intricate shapes such as the star or flower, use small scissors or X-Acto as needed. BE VERY CAREFUL when using the X-Acto, and keep fingers away from the blade. 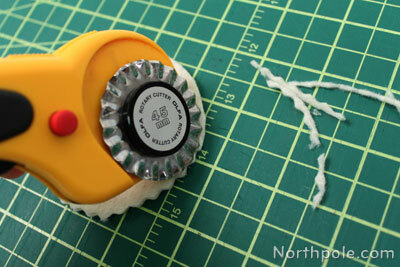 Clean up any fuzzy edges with mini scissors. 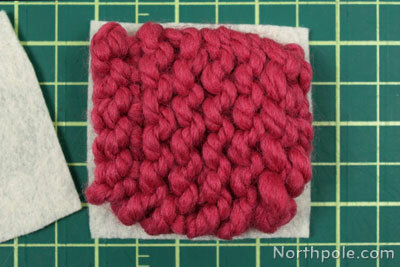 Place top layer on the middle layer, and trim the middle layer so that it is slightly smaller than the top layer. 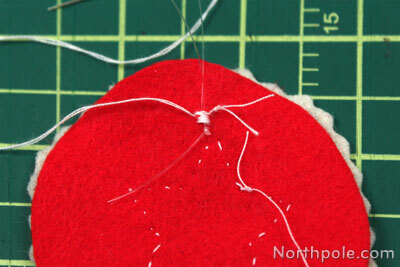 Take needle & thread and sew the top layer to the middle layer, sewing along the edge of the inner cutout. Cut a piece of clear string that is 10" and tie the ends together. 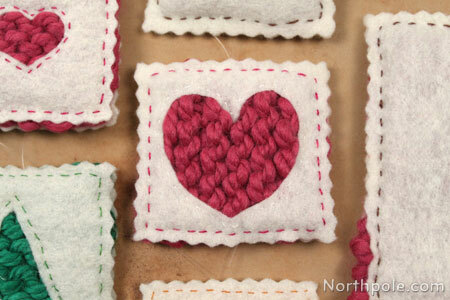 Place it near the top of the cookie on the back of the middle layer and sew it down with thread. 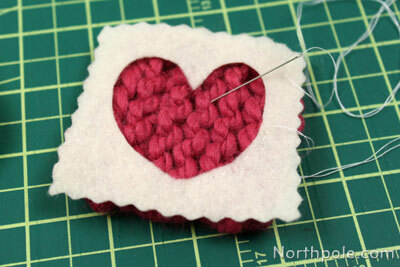 Note: Only sew it to the middle layer of felt. 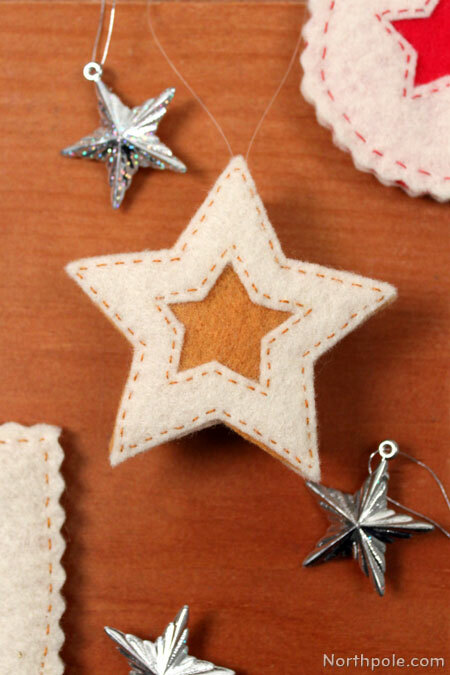 By doing this, the stitches will not be visible when the ornament is finished. Place the other ivory shape behind the top/middle layer and sew together around the sable's edges. 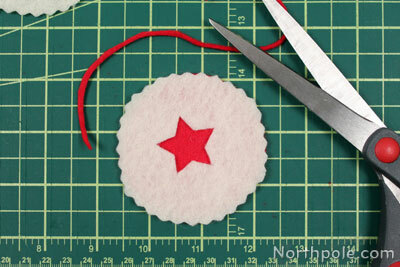 Using your yarn shape as a guide, cut 2 felt shapes that are just slightly larger than the yarn shape. 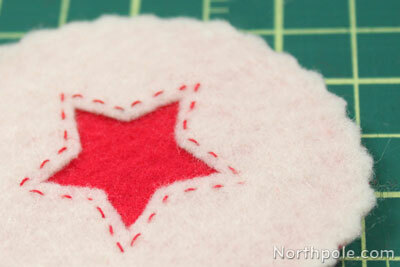 Use the pinking blade on the rotary cutter to cut wavy lines along the edges of the felt shapes. Take one felt shape and cut out the center shape. This is the top layer of the cookie. Sewing along the edge of the inner cutout, sew the top layer to the yarn shape. 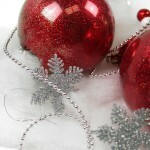 Make ornament hanger by cutting a strand of clear string and tie the ends together. 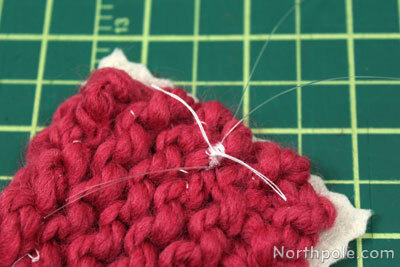 Glue or sew the ornament hanger to the back of the yarn piece. 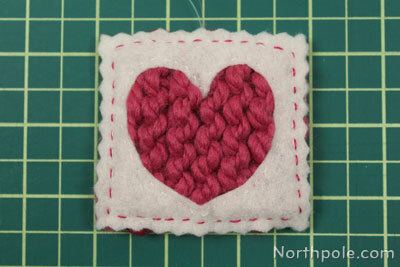 Sew the bottom layer to the top/middle layer. Now your cookie ornament is done! Make several, package in a bakery box, and give as a gift.